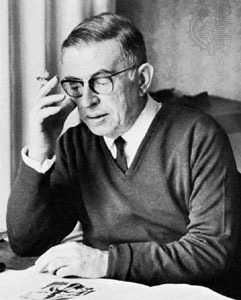 Seminal French existentialist philosopher Jean-Paul Sartre relates phenomenology, consciousness and intentionality to a theory of imagination that departs radically from prior conceptions in psychology. I will call the different immediate modes of apprehension of the real as a world ‘situations’. We can then say that the essential condition for a consciousness to imagine is that it be ‘situated in the world’ or more briefly that it ‘be-in-the-world’. It is the situation-in-the-world, grasped as a concrete and individual reality of consciousness, that is the motivation for the constitution of any irreal object whatever and the nature of that irreal object is circumscribed by this motivation. Thus the situation of consciousness must appear not as a pure and abstract condition of possibility for all of the imaginary, but as the concrete and precise motivation for the appearance of a certain particular imaginary. From this point of view, we can finally grasp the connection of the irreal to the real. First of all, even if no image is produced at the moment, every apprehension of the real as a world tends of its own accord to end up with the production of irreal objects since it is always, in a sense, free nihilation of the world and this always from a particular point of view. So, if consciousness is free, the noematic correlate of its freedom should be the world that carries in itself its possibility of negation, at each moment and from each point of view, by means of an image, even while the image must as yet be constituted by a particular intention of consciousness. But, reciprocally, an image, being a negation of the world from a particular point of view, can appear,, only-on- the ground of the world and in connection with that ground. Of course, the appearance of the image requires that the particular perceptions be diluted in the syncretic wholeness world and that this whole withdraws. But it is precisely the withdrawal of the whole that constitutes it as ground, that ground on which the irreal form must stand out. So although, by means of the production of the irreal, consciousness can momentarily appear delivered from its ‘being-in-the-world’, on the contrary this ‘being-in-the-world’ is the necessary condition of imagination.